Amazon CEO Jeff Bezos, the newly minted richest person in the world, just sold more than $1 billion worth of his stock. The sale was made public in a filing posted Friday. In total, Bezos let go of one million shares for $1,097,803,365. Exactly how Bezos plans to spend those Benjamins wasn't clear. But it isn't unprecedented for him to sell such a large chunk. In May, he sold more than a million shares. A similar sale was executed in August 2016. Even after his most recent sell off, Bezos still personally owns about a 16% of Amazon, which he founded in 1994. 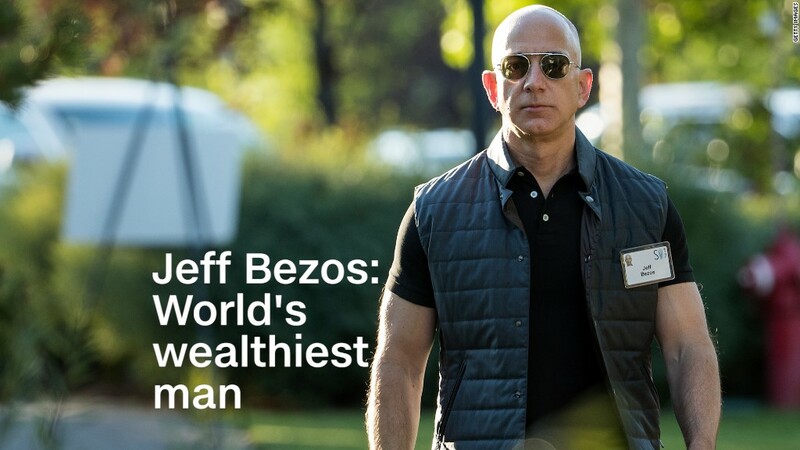 Bezos's large ownership stake helped vault him past Microsoft co-founder Bill Gates as the richest person in the world, according to the Bloomberg Billionaire's Index. His wealth spiked last week when Amazon stock jumped 13.5% after a stellar earnings report. Thanks to the stock surge, Bezos's net worth climbed more than $10 billion to a total of more than $90 billion. For comparison, Bill Gates is currently worth about $88 billion. One possible destination for the cash Bezos just freed up is his commercial space company, Blue Origin. Earlier this year, Bezos told reporters at a space symposium that he sells about $1 billion per year worth of Amazon stock to fund the company, according to Reuters. Blue Origin was founded more than a decade ago, but has yet to complete its first mission. The outfit's initial goal is to send tourists to the edge of space on a sub-orbital rocket, called New Shepherd. So far, the company has conducted only unmanned test launches. Last month, Blue Origin Chief Executive Officer Bob Smith said he expects the first manned flight to take place by April 2019. Blue Origin may need cash for new endeavors in its pipeline. The firm is looking to build a much larger rocket, dubbed New Glenn, that will be capable of carrying satellites into orbit. That would allow Blue Origin to compete with the likes of SpaceX and United Launch Alliance for lucrative launch contracts. Another possible use for Bezos's cash is charity. The tech mogul said in June that he wants to start putting some cash behind philanthropic efforts, and he asked his Twitter followers for advice. "I'm thinking I want much of my philanthropic activity to be helping people in the here and now -- short term -- at the intersection of urgent need and lasting impact," he wrote.